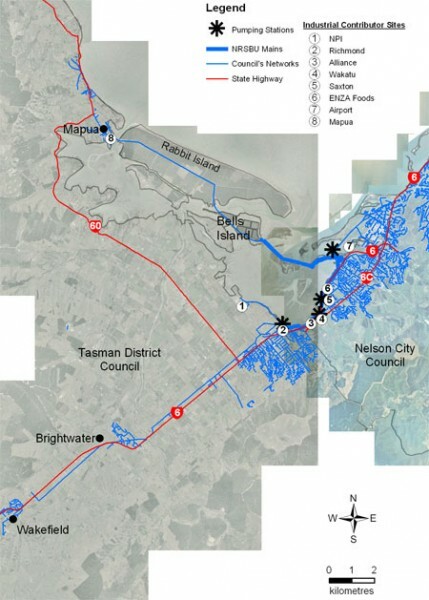 The Nelson Regional Sewerage Business Unit (NRSBU) is a joint committee of the Tasman District and Nelson City Councils. It oversees the Nelson Regional Sewerage Scheme (NRSS), which is evenly owned by each of the two Councils. The Waimea Estuary presents considerable difficulties for the discharge of effluent. Disposal in shallow areas can lead to concentration of nutrients and the growth of undesirable and environmentally degrading plants and algae. Public health safety must be protected because of the recreational areas in the estuary and the beaches near its mouth. Bell Island is well suited to be home to the treatment plant. The object of the scheme is to provide a high degree of treatment with particular emphasis on bacterial reduction, and to discharge well treated effluent only on the early phase of the outgoing tide in a position which ensures rapid mixing an interchange with the sea.